Radford's Bone China, Pattern #8246/B, Made in England from 1938 to 1957. Total of 4-Sets SOLD INDIVIDUALLY AND PRICED PER SET of 4-Pieces. 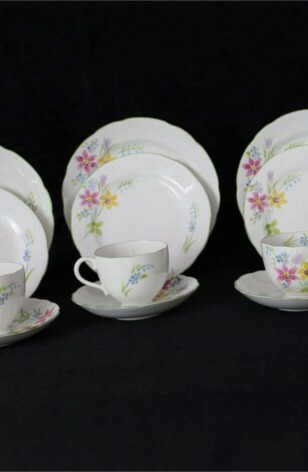 Vintage - Lovely Mid-Century (and prior) China "Quad" 4-Piece settings by Radford's Bone China. Consists of Cup, Saucer, Tea/Dessert Plate and Salad/Luncheon Plate. (4) Pieces each. These are Scalloped Cups, Saucers and Plates in White, with a beautiful Pattern of Multi-color Flowers (Pink, Blue, Yellow, Lavender) and Light Green Stem and Leaves. These sets would Brighten up any Breakfast Table. Buy one set, or all four... Being sold in "Quad" Sets. (4-pieces each) All pieces are trimmed in 22kt Gold. 4 - Saucers - 5 5/8"
4 - Tea/Dessert/Bread Plates - 6"
4 - Salad or Luncheon Plates - 8"